This weekend, the Super Pet Expo returns to the Dulles Expo Center in Chantilly, Va. The Super Pet Expo, sponsored this year by Evo Pet Food, unites pet owners and animal lovers at a shopping extravaganza and animal entertainment destination with more than 150 local and national pet product and service vendors, entertainment, adoptable animals and more. 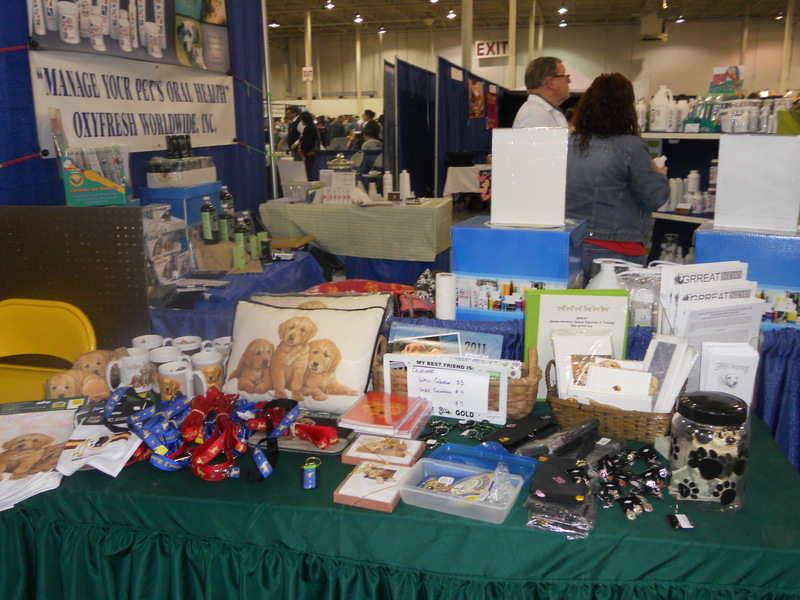 Just a few of the items for sale at the Golden Retriever Rescue, Education and Training booth at the 2011 Super Pet Expo. New this year, your pet can audition to appear on The Late Show with David Letterman’s Stupid Pet and Human Tricks segment! On Saturday, March 17 at 5:00 p.m., a talent coordinator for the show will be taping auditions to take back to the show for consideration. Tricks must be fun, unique and safe, and all types of animals are welcome. Teams whose tricks are selected will receive a free trip to New York City for the chance to perform their trick on the stage of the Ed Sullivan Theater in front of millions of Late Show viewers. You can let your pup get his/her ya-yas out in the nearly 5,000 square feet indoor puppy playground sponsored by A Dog’s Day Out. Also back this year, you can pose your questions to representatives from the International Association of Canine Professionals to answer your questions about pet behavior, and a free workshop with Dawn Wolfe, owner of Pawsitively Famous Animal Actors. Leashed dogs are welcome, but no flexi-leashes will be allowed. Show hours are 4:00 to 9:00 p.m. Friday, 10:00 a.m. to 7:00 p.m. Saturday and 10:00 a.m. to 5:00 p.m. Sunday. Admission is $13 for adults, $8 for children ages four to 12, and free for kids three and under. Tickets can be purchased at the door on online at www.superpetexpo.com.